Oklahoma – again. I am getting to know Oklahoma more than I would have ever guessed. Work and family have been taking me there a lot lately. Now, when I go, I try to see different sections of it, because it has proven interesting each time. I mean – the Blue Whale of Catoosa, no less. And then there was the beautiful, healing trip through the panhandle. I do hope to travel to other states for work as well, but I have appreciated these trips. In fact, for this trip – in which I took an extra day and drove through SE Oklahoma, I wish I hadn’t been on such a schedule. I had four places I wanted to go to in seven hours, but I kept seeing interesting road signs (“Coyote Bar – It’ll Do”), homemade sculptures (a giant hand with a butterfly on one finger), and small town main streets that I wish I had had time to stop and photograph. In fact, I want to make a trip just to take pictures of the many, various animal sculptures I saw on the roadside: horses, bison, and bulldogs. I did get to take a picture of real miniature horses and pygmy goats. 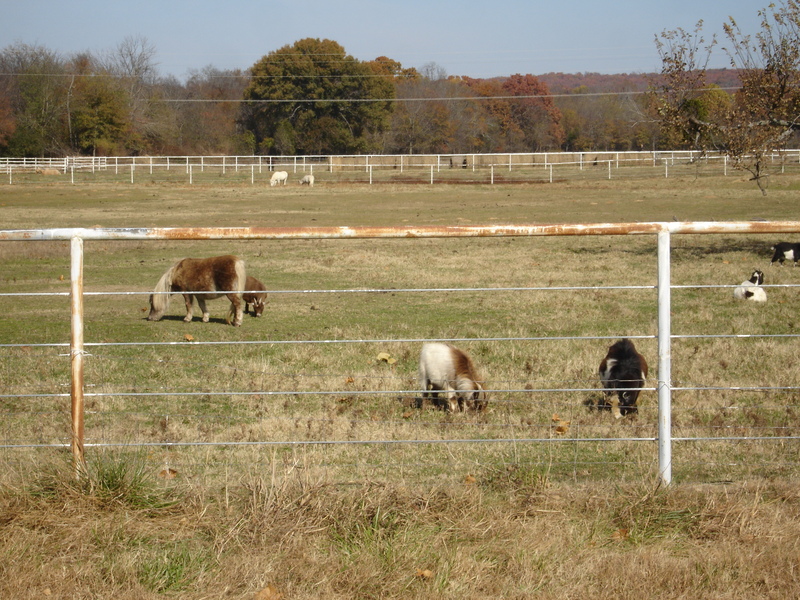 And I love little miniature horses and pygmy goats – seen on the way from the cabin. But the goal this week was to see some Western history and landscapes indicative of SE Oklahoma, which is sometimes referred to as Indian Nation. First on the list was the cabin of Sequoyah, who invented the Cherokee written language, and then pretty close by were the Spiro Mounds – ancient Native American ceremonial and burial mounds from AD 500 – 1400. Then I planned to drive through the Ouachita National Forest, in order to see just how hilly Oklahoma could get (damn hilly). Finally, my main goal was actually to see Robbers Cave State Park, where the outlaws Jesse James and Belle Starr “holed up.” Belle Starr was apparently “in the family,” according to my aunt Leta, but I don’t know the details. Unfortunately, I wound up not having time to see the last one. So I still don’t know about Great Aunt Belle! Maybe when I am holed up for winter in DC, I will do some research. Anyway, I began my road trip after I dropped off colleagues at the airport in Oklahoma City, and headed east in a very fuel efficient minivan. Really. It was a hybrid, and on a flat surface it got at least 30 mph in EconFuel mode. I was rather amazed. And Oklahoma is flat in most sections, so it worked out well until I got to the mountains. Getting to Sequoyah’s Cabin, near Salisaw, was a relatively pretty drive. Sequoyah had built this log cabin by a spring, with woods and creeks around. Of course, it was a very small Oklahoma historic site, but the cabin reminds one of how lucky many of us are today to have decent houses with electricity, microwaves, and toilets. The Cherokee Syllabaly – where each letter represents a syllable. How glad I am that my windows are not like this. The east Oklahoma landscape. Beautiful woods, and many white board fences. But people got by, and made progress – inventing things that improve lives. Sequoyah had invented a syllabaly so he could sign his name to the products he made as a silversmith, but he helped share it with his people, the Cherokee, so that they could have their own way of communicating in writing. The ranger, who seemed starved for human company, taught me the basics on how to read the Cherokee language. He went through how the symbols matched the spoken sounds of the Cherokee, and, using a DOS system and a dot-matrix printer (because it still works), printed out my name in Cherokee: ᎠᏁᏘ. By the way – if you want to learn more of the language, the Wikipedia site gives a good overview, but you can listen to some Cherokee here: http://www.learnnc.org/lp/editions/nchist-newnation/4530. South about 20 miles is a much older site, the Spiro Mounds. It is called prehistoric but that term, which means ‘before writing’ only applies locally not globally in this case. The site was occupied as late as AD 1400 and definitely humans in other locales were writing by then. The Spiro people themselves had pictography. But the culture was more Mayan/Aztec than I imagined – or maybe it was just how the artist depicted the people. Definitely, temples and houses were built on top of mounds based on celestial axes, and there were plazas where ‘stickball’ was played. The mounds were underwhelming, but the ceremonial aspects were interesting. When the spiritual leader died, his wife/wives and servants were killed along with him. Their bones were laid out on the top of the burial mound, and allowed to decay. Apparently a group of elders, who grew their nails especially long, would then go and pick the remaining flesh off the bones, and bundle and store them in the Mortuary house. Again, seeing this site helps put things in perspective: I am so glad to be living in this age. More information about Spiro Mounds is provided on Wikipedia. One main goal of this trip was to see the Ouachita mountains of Oklahoma, which I thought would be like the Arbuckle Mountains – rocky, forested, great hidden grottoes. But the Ouachita Mountains are serious mountains (with seriously beautiful fall colors). Definitely the minivan I was in felt they were mountains – it kept overheating going up the switchback roads. It became hard to enjoy the drive when I once got out of the van at a viewing spot, and smelled burnt oil. I had to start driving quite slowly – which is why I didn’t have time for seeing Robbers Cave after that. But the view was worth it and impressive. Fyi, Here is NASA’s view of the Oklahoma side of the Ouachita Mountains. 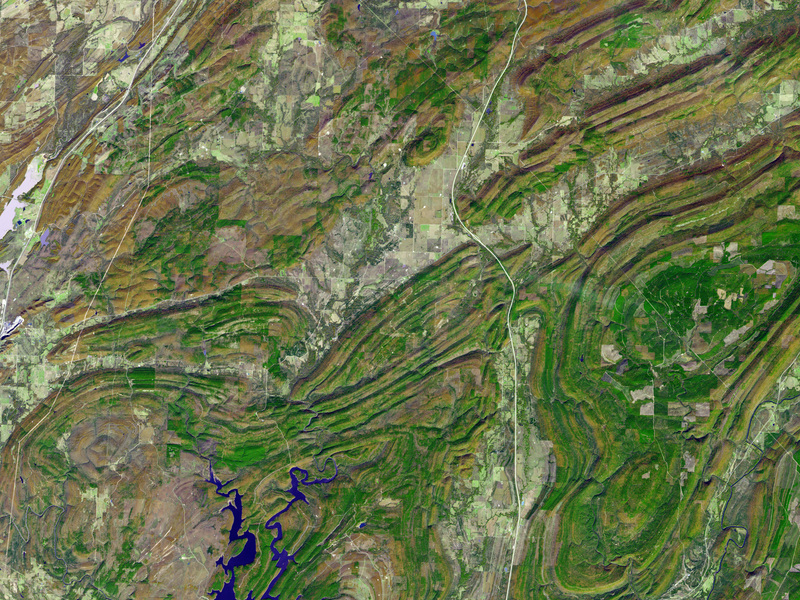 NASA’s satellite image of the Ouachita Mountains in Oklahoma. I wish I had taken this picture (2nd picture down): http://photosofarkansas.com/tag/ouachita-mountains/. And finally I made it to my cousin’s place in south central Oklahoma later that evening. But, to continue my cultural immersion, the next morning she took me to the Chickasaw Cultural Center to see an exhibit on canoes and some of their traditional dances. I could write more here about the new things I learned regarding the interesting history of the Native American tribes within Oklahoma, from pre-European-contact to more details on the incredibly sad and shameful Trail of Tears, as well as about the tribes’ modern times, but I’ll just sum up the morning instead with: it is a very beautiful center, with incredible exhibits, and nice people. We followed this up by a trip to their chocolate factory. Yes, chocolate. A great end to a great trip. I love this diorama, which was made for the canoe exhibit. Whew, that was a long blog. Overall, SE Oklahoma is such a contrast to my long experience with NW Oklahoma: mountains, hills, greenery, and much more richness of the landscape. Many more farms as well. But both are very beautiful in their respective ways. P.S. Because it was a long trip, just for me, in a minivan no less, I also decided to offset my carbon footprint. I used the travel calculator for NativeEnergy (Native Americans supporting wind energy, etc..), which I thought was appropriate. Total CO2 produced from driving 366.5 miles at 25 mpg: 0.15 tons (wow). Carbon offset cost = $14.